Gregory Gymnasium was opened in 1930 as the first phase of the “Union Project,” a massive fundraising effort by University alumni to build the student union, a men’s and women’s gymnasium, and an auditorium. The building is named for Thomas Watt Gregory, an 1885 UT law graduate who served as U.S. Attorney General under Woodrow Wilson. Gregory spearheaded and provided the leadership for the Union Project as president of the Texas Exes. 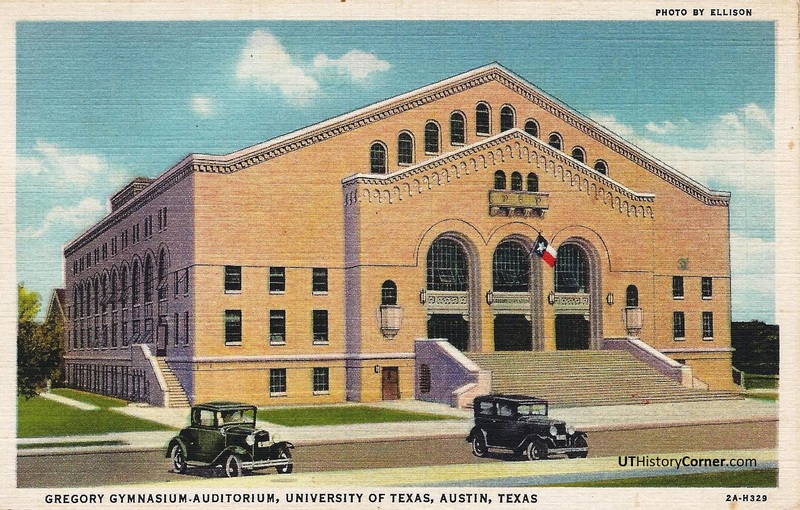 A photo postcard of Gregory Gym, taken soon after it was opened in 1930. 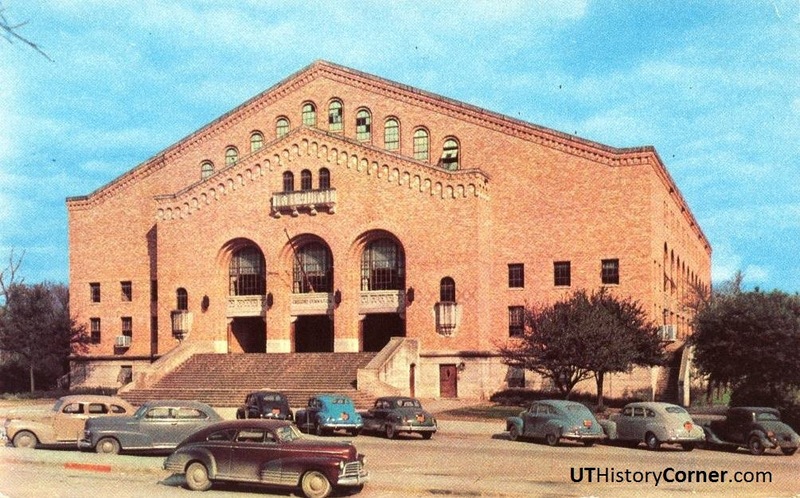 The gym was the home of the UT men’s basketball team, as well as the scene of some popular University dances when the crowds were too large for the Texas Union ballroom. In the 1930s Benny Goodman and Glen Miller, among others, performed here. 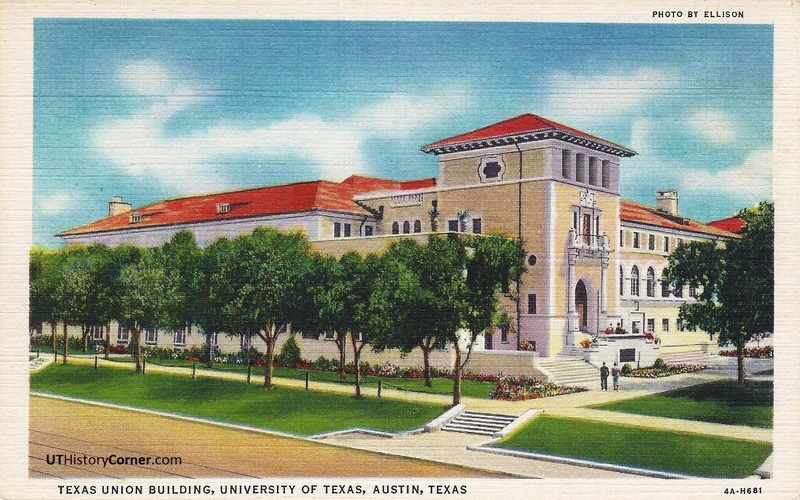 A linen postcard of the Home Economics Building, since named Mary Gearing Hall and headquarters for the School of Human Ecology. The tan-colored walls are incorrect, as they are made of white limestone. 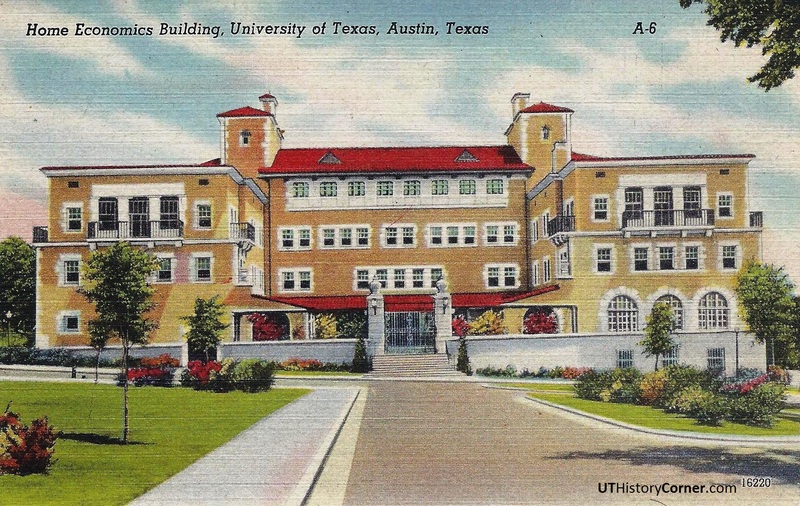 Architect Paul Cret used a similar design he created for the home economics department at the University of Wisconsin for the building in Austin, though the UT style is more of a Spanish casa. 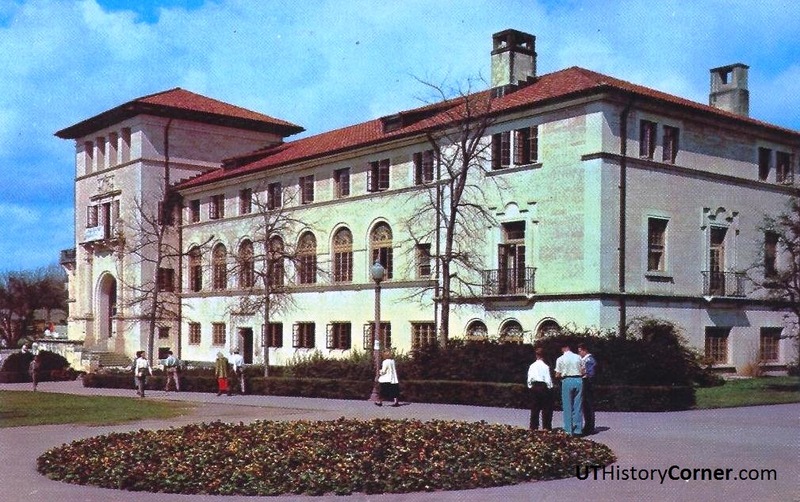 Opened in 1933, the Texas Union has been a hub of campus life for decades. Designed by Paul Cret and Robert L. White, the building is heavily Spanish in character. For many years, the main entrance was the through the arched doorway under the square tower, with a second door for the campus cafeteria, or “commons.” Look close, and you see that additional entrances have been added along the south side of the building. 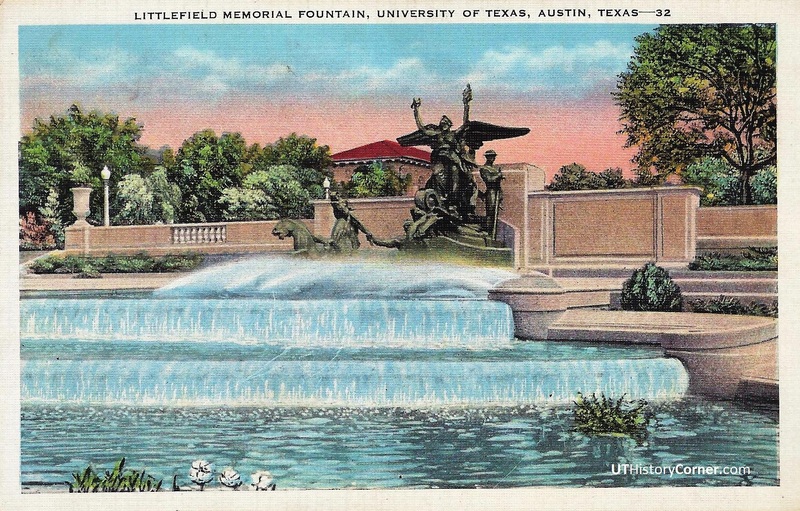 This view of the Littlefield Fountain is relatively rare. 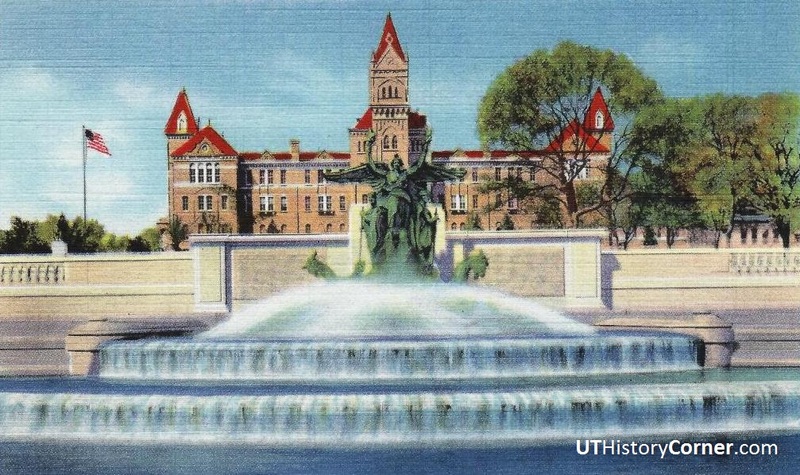 While the fountain was finished in 1933, the old Main Building was razed just two years later, 1935, to make room for the current Main Building and Tower. 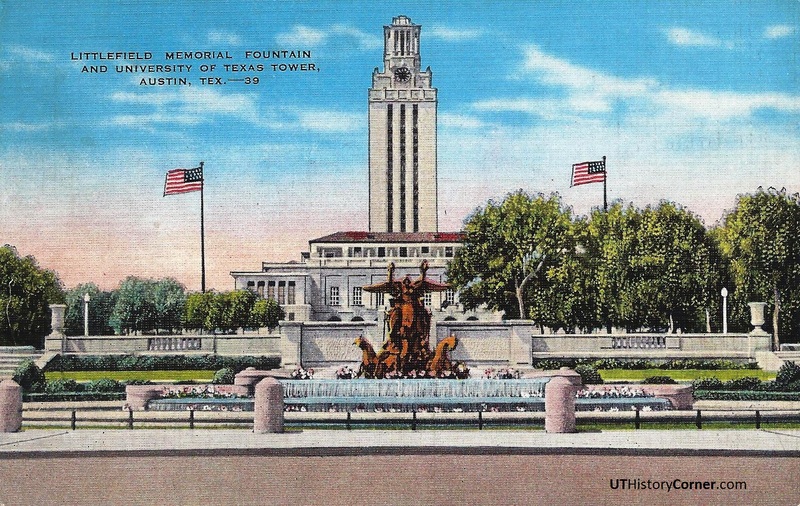 A linen postcard from the late 1930s, soon after the UT Tower was opened in 1937, made by colorizing a black and white photograph. The live oak trees on the South Mall were purchased from a nursery in (appropriately) Orange, Texas and planted in 1933. A great view of the West Mall, taken about 1940. Along with the South Mall, the West Mall was a second “main entrance” to the campus. 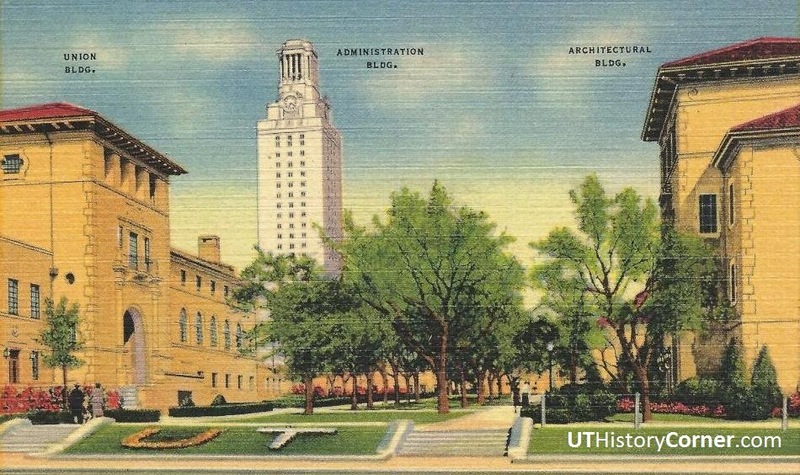 To emphasize its importance, architect Paul Cret placed square towers atop the Texas Union (left) and Goldsmith Hall (right). From across the street, the buildings provided a visual gateway for the west entry. The Main Building and Tower was originally used as the University’s main library. A closed-stack library, patrons went to the second floor reference room to search a card catalog and write down the needed book call numbers. Requests were presented to a librarian at the main desk, who then phoned staff on the appropriate floors in the Tower, which housed the book stacks. The books were retrieved and sent down to the main desk by a small elevator to be checked out. 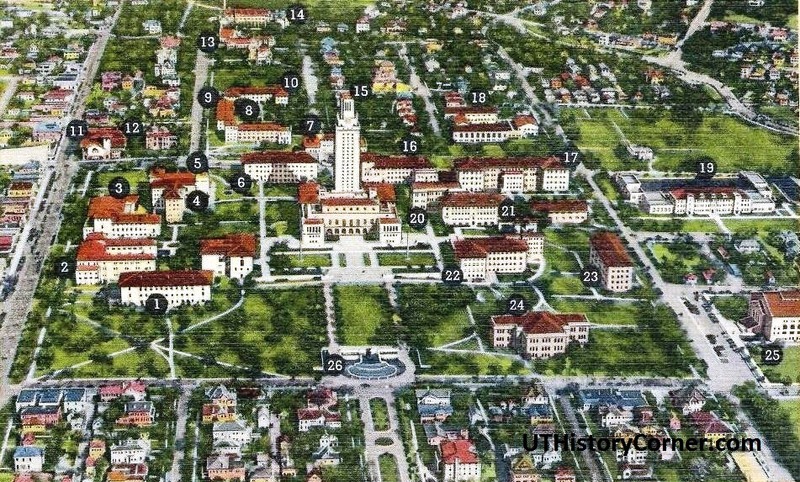 An aerial view of the UT campus taken around 1938. 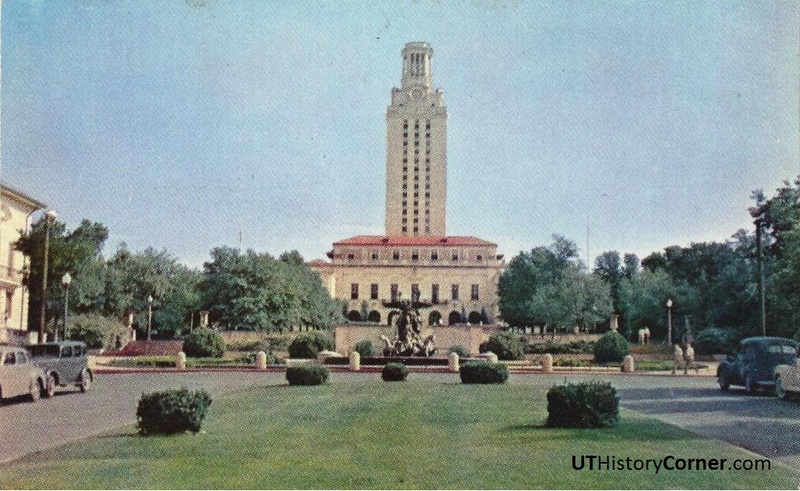 The Tower was completed in 1937, and the first of the “six pack” buildings on the South Mall (today’s Rainey Hall) would appear in 1942. Building number 19 was Taylor Hall, named for the first engineering dean Thomas Taylor. It’s recently been razed in favor of the new Gates-Dell computer science complex. Building 24 was the old Law Building (see above). It was replaced by the Graduate School of Business Building in 1977. 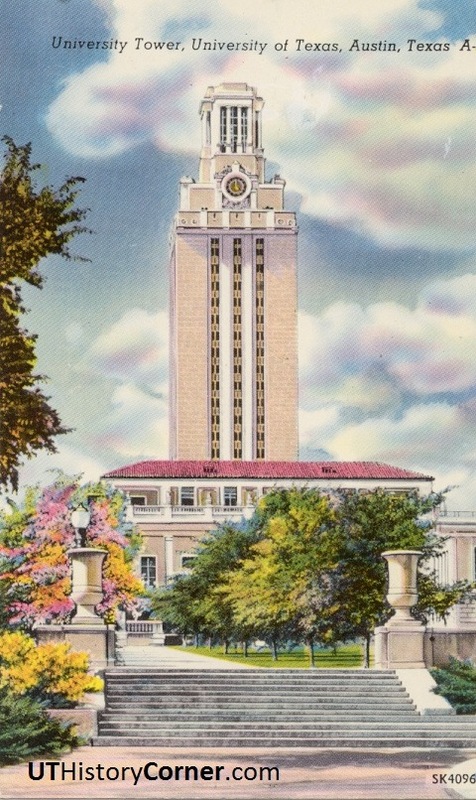 A linen postcard of the Main Building during World War II. While the two flag poles actually displayed the U.S. and Texas flags, the Stars and Stripes were patriotically drawn as flying from both.